In R (FB and NR) v Secretary of State for the Home Department  UKUT 428 (IAC), the appellants challenged the legality of the Home Secretary’s removals policy (traditionally known as Chapter 60 of his Enforcement Guidance and Instructions, now titled Judicial reviews and injunctions). Specifically, the challenge tackled the policy of removing people from the UK at any time during a “removal window” (usually a three month period subject to extensions) without informing him or her of the exact time and date that removal will take place. The outcome of the litigation has been the revision of the policy to introduce greater flexibility — including provisions to ensure consideration is given to whether deferral of removal is necessary on the facts — and new safeguards to ensure there is greater certainty for those who are subject to removal windows. The policy is not sufficiently flexible in terms to cater for individual cases. In his written case, responding to (c), the Secretary of State proposed significant amendments to version 14, confirming it would be “revised and updated” in several significant respects. Provide all relevant documents to representatives upon request. The applicants were granted permission to amend their claim to embrace a challenge to the amended policy which was then listed for a ‘rolled up’ hearing. In a judgment handed down on 31 October 2018 and reported on 14 December, the Upper Tribunal granted the applicants permission to bring judicial review proceedings on all grounds. 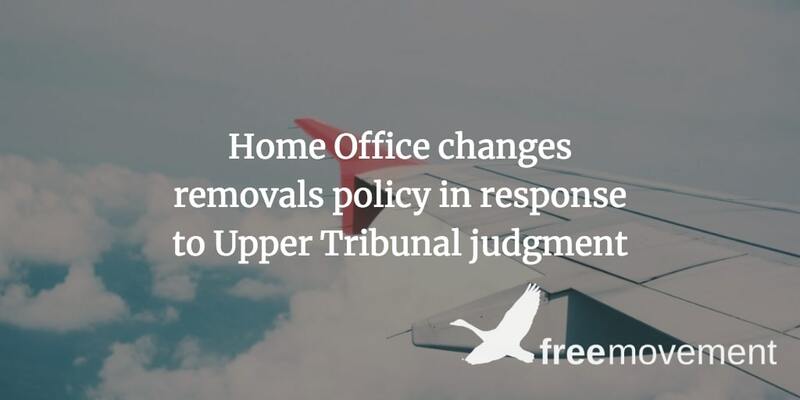 The Upper Tribunal declined to make an order declaring that version 14 of the removals policy was unlawful, as it had been superseded and they had considered the new version in a “rolling review”. This was despite the fact that, as the tribunal observed at the subsequent costs hearing, it was “plainly deficient in material respects” and the Secretary of State was ordered to pay the applicants’ costs to the date of the new policy (and a percentage thereafter). It also held that version 15 of the policy was not ultra vires, it did not deny access to justice, and there was no requirement for notice of removal directions to be given in addition to receiving notice of liability to removal. Fails to provide that the route and place of return must form part of the notice; especially when an applicant is to be returned to the “safe part” of a country [205-6]. Noted that the Home Office owes detainees a significant duty of care which may, depending on the facts, require a degree of proactivity on its part in identifying whether there is evidence that the detainee is an ‘adult at risk’ . Whilst it would not give relief, suggested that the Secretary of State give “serious consideration” to whether a stronger test (than “reasonable prospect of removal”) is required in order to extend the three month ‘removal window . The Secretary of State’s “removal window” policy, as set out in Chapter 60 of the General Instructions of 21 May 2018, was, as a general matter, compatible with access to justice but was legally deficient, both in its treatment of cases where a removal window is deferred and in the lack of information regarding place and route of removal. Cosmetic changes were in version 16 of the removal policy in October 2018, but on 5 November 2018 the Home Office published version 17 implementing the Upper Tribunal’s findings. The main new feature is the introduction of two new removal notices — the RED.005 and RED.006. RED.005 is to be used when ‘the person is no longer eligible to be removed in the 3-month removal window, (for example because they have made a subsequent protection claim or are a relevant adult at risk)’. This introduces some certainty for individuals and their representatives as to whether a removal window has been withdrawn or is still active. RED.006 is the form of notice to be used when a request for deferral is granted. The effect is ‘extending the notice period (and removal window by the same amount) to ensure the person has a reasonable opportunity to access legal advice.’ This increases certainty and addresses the ‘arbitrariness’ averted to in the judgment. The effectiveness of these changes will depend largely on the Home Office’s application of the new provisions in practice and therefore remains to be seen. We are very interested in hearing about your experiences with the application of the new policy. If you have any examples from practice, please do not hesitate to contact us: huseinm@duncanlewis.com. Sonali Naik QC and Ali Bandegani (Garden Court Chambers) were instructed by Toufique Hossain, Raja Uruthiravinayagan and Husein Meghji (Duncan Lewis Solicitors). The Public Law Project was granted permission to intervene. It had been monitoring the “removal window” policy since its inception in 2014 and submitted evidence in support of the applicants. This article was originally published on 29 November and was updated when the case was officially reported by the tribunal.